Audio2SWF is an extremely easy program to convert your audio files into streaming Macromedia Flash files. 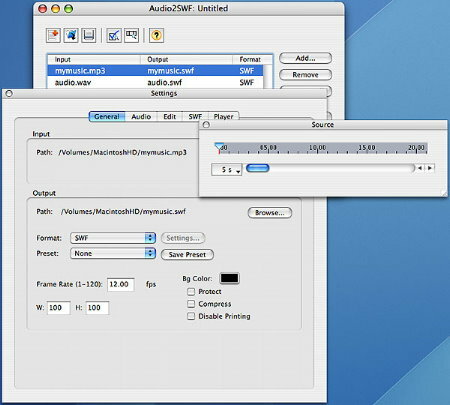 Audio2SWF is easy to use and is great for publising audio for websites. * It Just Works! Over 97% of all browsers already have the free Flash player installed, so you won't have to worry about your audience being able to listen to your Flash audio. * Flash audio will stream through firewalls! * Flash audio does not require a streaming server!. Put Flash audio right on your website and it is ready for listening without any extra hardware. * Output Macromedia Flash movie files (SWF). Over 97% of all browsers already have the Flash Player installed, so you won't have to worry about your audience being able to hear your audio. * Output Macromedia Flash Video files (FLV). * Output HTML files to quickly generate a web page for your audio. * Select your audio compression quality. * Add customizable players to add playback controls, sound controls, scrub bars, and more.